The Acting Chief Secretary for Bougainville, PAUL KEBORI has called on all ABG departments to support, the Secretary for Referendum and his office in their effort to fast-track referendum preparations throughout the region. KEBORI made this call at the opening of the Referendum Office in Buka this afternoon. He said that his office will support the Referendum Office and called on other divisions to also do the same.KEBORI said that the task ahead was enormous and demands co-operation by all Bougainvilleans to make the job a little easier. The Acting Secretary for the Department of Referendum, Peace and Veterans Affairs, JAMES TANIS says that his office needs to settle in a proper office to prepare for the upcoming Referendum. Speaking at the opening of the Referendum Office in Buka , MR. TANIS said that his office has started receiving International visitors and due to no office, they have been meeting visitors under shades and in guest houses. The ABG Vice President and Minister for Referendum, Peace and Veterans Affairs, PATRICK NISIRA this afternoon called on his officers to stop all unnecessary expenses such as Hire Cars and other payments in the name of his Department. Speaking at the opening of the Bougainville Referendum Office in Buka this afternoon, MR. NISIRA said that he wanted all expenses reduced as the region had no money due to the non payment of the Restoration and Development grants for the last three years. NISIRA called on Directors, JAMES TANIS, Referendum, Peter Sohia, Veterans and Laurie Patrick, Peace to return all hire cars and use only divisional vehicles starting today. He said that if the ABG needs to reduce its expenses then, it should start with the Referendum, Peace and Veterans Department. The office of the Department of Referendum, Veterans Affairs and Peace has completed its Trident Strategy Plans for the region. Acting Secretary for the Department, James TANIS said the department has completed holding meetings and dialogue with all the Meekamui Factions, Panguna Veterans and Noah Musingku on the move towards referendum. Tanis says all these discussions have been very successful and fruitful adding that ABG officials attending the Rabaul JSB Meeting will be in a stronger and better position to present the government’s case. He said the ABG is very serious about what it is doing in progressing the region towards the conduct of referendum and most importantly for a good outcome . He said that since the last JSB, the ABG has taken steps to implement the ABG’s part of the bargain, that is it created the Ministry, It approved the Acting Appointments, Trident strategy and completed its key Consultations with all different factions regarding the Bougainville Referendum. “I wish to take this opportunity to announce that my ministry as part of its trident strategy will continue consultations with the veteran communities in South, Central and North Bougainville.” “My team has already done the first part of the consultations down in Buin on the 2nd and on the 4th in Central Bougainville and on the 6th will complete veteran consultations at the regional level here on the northern tip of Bougainville,” Mr Nisira said. He also said on the 16th of this month his ministry and the office of the speaker will invite ABG members to a referendum workshop at the parliament level. “The purpose of this workshop will be to formulate a common position on key issues about the actual date of the conduct of referendum, the choices available which includes the option of separate independence for Bougainville, the code of conduct during the referendum and also on the steps Bougainville needs to take after the referendum,’’ he said. Mr Nisira stated that these were important steps that must involve the elected leaders on Bougainville. “Referendum is a political agenda and all elected leaders are called upon to provide leadership in each constituency to prepare Bougainville for the referendum, successful conduct and peaceful transition to the next steps ahead,” he said. The Vice President also announced that the ABG will officially open a Mekamui office within the Bougainville administration to assist ABG with completion of reconciliations, unification and weapons disposal. The opening of the Mekamui office will coincide with the MDF Commanders first visit to Buka after signing agreements in Panguna. 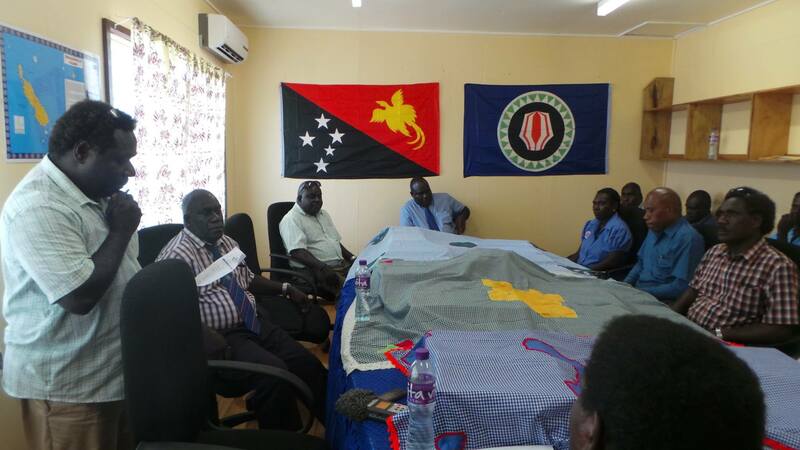 After completion of the ABG parliamentary workshop on referendum, a Bougainville leaders team will take the Bougainville position and negotiate it at a referendum summit in Port Moresby. And the agreed outcome of the summit on the key referendum decision will be presented to the Joint Supervisory Body (JSB) on the same week on the 3rd of December.